Celebrating the holidays with light is a custom common to people of faith. Many Presidents have participated in lighting ceremonies marking Hanukkah, the eight-day Jewish Festival of Lights. This year marks the first year a Hanukkah lamp (a menorah) was lit in the White House residence. President and Mrs. Bush commemorated the holiday by participating with members of their staff and some of their children in lighting the second candle on December 10, 2001. The 100-year-old lamp was borrowed from the collection of the Jewish Museum in New York. "Tonight, for the first time in American history, the Hanukkah menorah will be lit at the White House residence," said President George W. Bush at the ceremony in which 8-year-old Talia Lefkowitz helps in lighting the menorah Dec. 10. President Jimmy Carter walked to Lafayette Park in 1979 and lit one candle or shammash (the candle used to light other candles) in the 30-foot electric silver menorah. President Ronald Reagan visited the Rockville Jewish Community Center in 1983 and gave remarks following the lighting of the menorah. The Synagogue Council of America gave President George H.W. 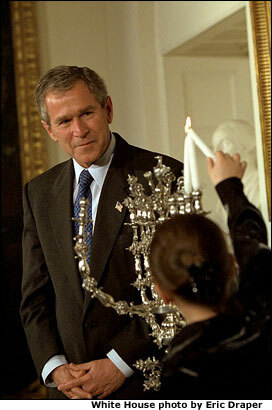 Bush a menorah, which was displayed at the White House in 1989. President Bush participated in a Hanukkah celebration for staff in the Eisenhower Executive Office Building in 1991 and also celebrated with children and local Jewish leaders. President William Clinton lit a menorah in the Oval Office in 1997 and joined Israel's President Ezer Weizman in lighting the first candle of Hanukkah in Jerusalem in 1998.